Effective communication is vital on vessels of any type or size, especially sailboats — whether the task is raising or dousing a sail, departing a dock, preparing to anchor, retrieving a man overboard, or when changing speed or heading. Those in command should be very explicit, clear, and timely when giving verbal orders. Not doing so can jeopardize crew, passenger, and vessel safety. The focus of this article is on internal (on-board) communications. Power and sail boat operators can apply the tips in this article to ensure that on board communication techniques convey vital information to all onboard in an timely and unambiguous manner. The first thing passengers or crewmen should do before coming on board a boat involves communication: using the ages-old nautical custom of announcing to the captain or crew: “Request permission to come aboard!” The announcement serves a very practical purpose, especially on smaller boats where weight distribution is a concern: it lets the captain know that more weight is about to be added, which may cause the boat to heel unsafely or otherwise move with the added poundage. Depending on boat size and the weight of gear already on board, the captain may have passengers move to a specific deck area to help distribute the added weight or to postpone coming on board until gear is shifted. A lot of important information, much of it in numerical form, flows into and out of a helm station or bridge while a vessel is preparing to depart, while underway, and during close-quarters maneuvering, heavy weather, or on sailboats during a race. Course heading, time, and distance to a sailing mark or landmark, chronological time, vessel, and wind speed, tide movements, lookout reports, docking instructions, and loads of other data are exchanged constantly between captain and crew that are critical to safe vessel operation and crew protection. To make transmitting this data easier and more readily understood by all, many recreational boat operators apply communication procedures utilized on military and commercial vessels to their boat operations. The tips mentioned below can assist in establishing those procedures or improving ones already in use. To separate chronological time from other numerical data, the 24-hour clock (military time) is often used, which uses a four-numeral standard. Using this technique takes some practice, but can help distinguish between different sets of numbers during a busy sail or powerboat voyage. Prior to departure on a voyage with passengers, determine what nautical skills they possess and if they are willing to help operate the vessel. Demonstrate the tasks they would perform and confirm their understanding. During the pre-departure briefing, show the location of all safety equipment and demonstrate operation. Also, describe by name each piece of gear that may be used during a trip (winches, cleats, boat hook, tow lines, etc. ), and where it is located. Describe how commands will be given, the preferred method for acknowledging, and how to report that the task has been completed. Plan tacking, jibing, docking, or other task requiring crew involvement well in advance and position the crew where needed before the operation. Use verbal instructions that are clearly directed to and understood by the appropriate crew member(s) by using their name or where they are stationed. Use a command voice that can be heard and understood by all; noise from an engine, the wind, nearby boats, or other sources may require a louder than normal voice volume. Based on crew experience and boat familiarity, use succinct but complete commands and nautical terms. On sailboats, ensure all understand the “windward” and “leeward” sides, as they change constantly with tacks and jibes. During sail races, advise crew/passengers to avoid unnecessary conversation that could distract helmsmen, tacticians or navigators. Also, it may be helpful to suggest where crewmen should stand or sit when not handling sails or other gear. When changing a helm watch, the current helmsman relinquishes it only when the new helmsman is facing forward, is briefed on course heading, tack, point of sail, weather, etc., and has control of the helm and the boat, at which time the oncoming helmsman says, "I have the helm.” All on board should know that the helm watch has changed. Particularly in close quarters maneuvering, ensure that lookouts know how to report observations, such as distance of other boats or landmarks relative to the vessel. Listen for helmsman commands and acknowledge by parroting back the command with the same words used by the helmsman/operator. When a task is complete, report that it has been performed, and wait for the helmsman’s confirmation before starting another task. On sailboats, know which side is windward and leeward, as they change constantly with tacks and jibes. Keep a sharp eye on other crewmen and for situations that could create a safety concern, such as feet entwined in line, moving booms, untended running lines, etc. Immediately alert the helmsman of situations that cold pose a potential safety issue. Avoid unnecessary conversation that could distract the boat operator, helmsman, tacticians, or navigators, particularly at night. Stay tuned to activities of other crewmembers, anticipate the next task in an operation, and be ready to respond when given a command. Depending on preference and operating conditions, particularly during an anchoring or mooring operation, captains and crew may use hand signals to communicate commands in addition to, or in place of, verbal orders. Engine and wind noise, the distance between the bow and helm, and the fact that the anchor crew is facing forward can create situations in which pre-determined hand signals are more efficient than verbal orders. The crew also uses hand and finger signals to indicate distance from a boat to an object, like a mooring ball or anchoring point. Some basic hand, arm, and finger signals are described below. On sailboats, hand and arm signals are used either with arms extended in front of or to the side of the torso or at right angles to the deck. Arms straight above the head may be blocked by the mast or sails. “Stop the boat” — With the back to the stern and facing forward, the arm is at a right angle to the deck with a clenched fist. “Back up” — The arm is at a right angle to the deck, with thumb pointed aft in a hitch hiking motion. To indicate direction — The right or left arm is extended in front or to the side of the torso, pointed in the direction of the anchor rode or mooring line. To indicate distance — Fingers can also indicate pre-determined distances. As a boat approaches an object, five fingers might indicate 50 feet; four fingers to show 40 feet, etc. Under 10 feet, each finger would represent one foot. Man Overboard (MOB) situations occur occasionally, generally more often from sailboats than power vessels. Effective communication can literally save the life of the MOB by getting the person back on board quickly and with as little effort as possible. 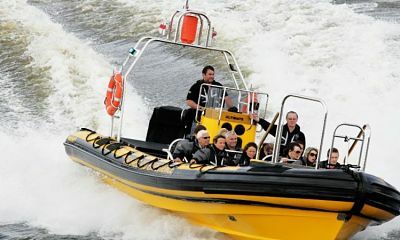 The captain bears ultimate responsibility for retrieving the MOB, including directing the crew and ensuring that effective communication techniques are used for locating and tracking the person in the water. Prior to a sailboat race or a powerboat cruise, the captain should brief crew and passengers on the verbal and visual signals utilized during a MOB situation, where retrieval gear is stowed and how to use the gear. Also, unannounced and realistic MOB drills should be conducted while underway that involve all on board, and in different wind, sea, weather, and operating conditions. These time-tested techniques help to ensure that onboard communication conveys vital information to crews and passengers in an explicit, clear, timely, simple, and unambiguous manner during any type of maneuver.